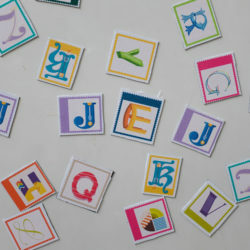 Kathy: Part of the appeal of hand lettering is that it’s a handmade art form. 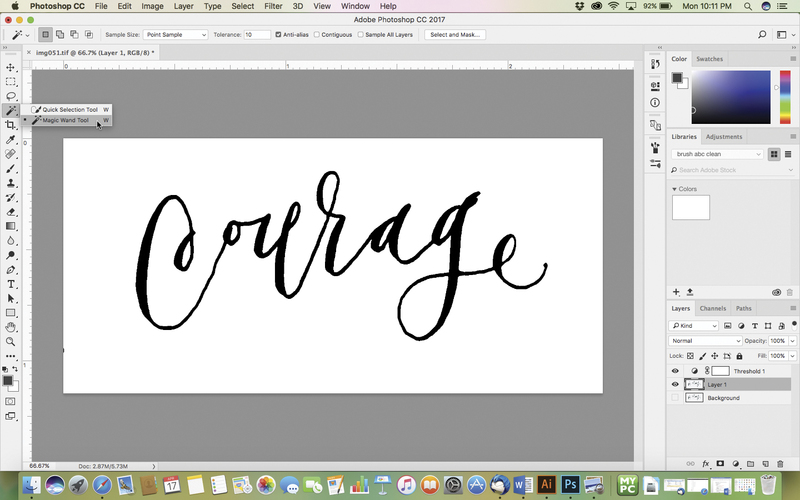 But there may be times that you want to digitize your lettering, such as to have your designs professionally printed at places like Spoonflower or to create a repeating text. You can do this in two ways depending on your needs: If you’ll be using the lettering at the same scale as it’s drawn, digitizing your lettering in Photoshop is fine. 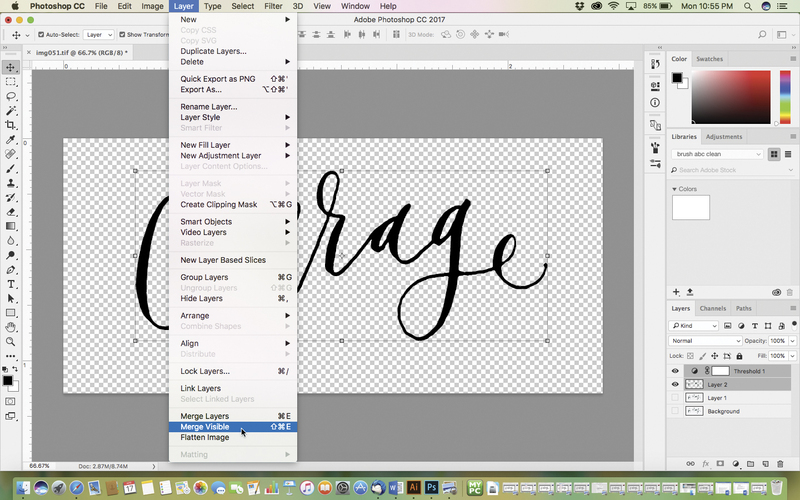 If you want to be able to use your lettering in a variety of different sizes, like on a business card and on a T-shirt, then you should use Adobe Illustrator, which allows the image to scale without losing clarity or resolution. 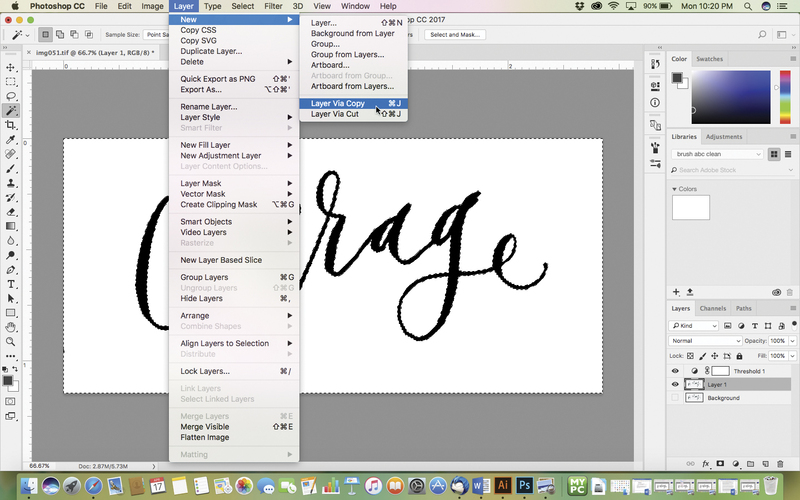 Today I’ll be showing you how to digitize your hand lettering in Photoshop. 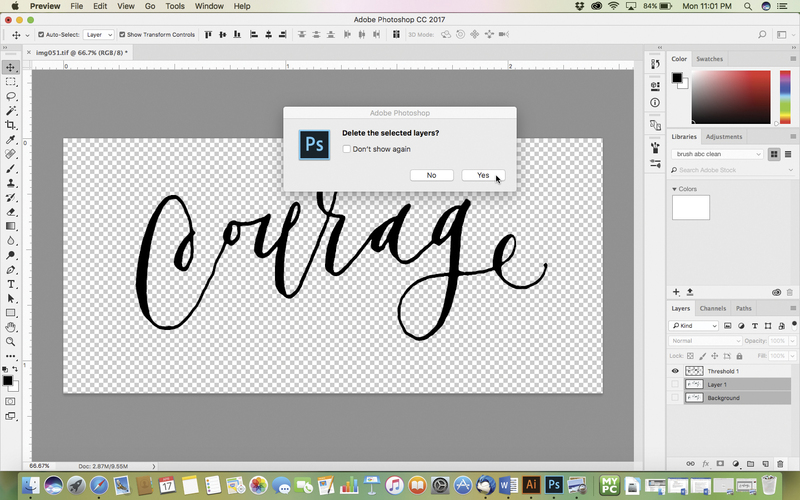 Before you digitize your image with Photoshop or Illustrator, you have to get it into your computer. You can take a digital photo or scan it. 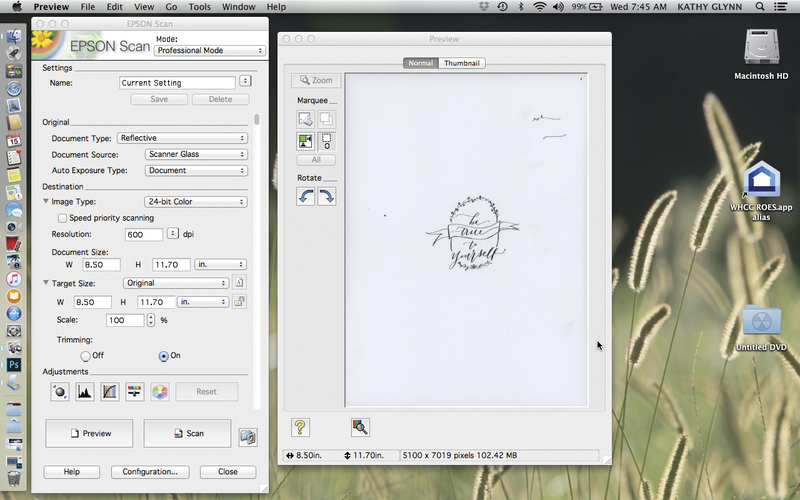 I prefer using a scanner because it’s more accurate than a camera. Unless you have very steady hands or a tripod, taking a photo can easily distort the image. I use an Epson scanner but whatever type of scanner you have, the basic steps will be similar. Open the software provided by your scanner or that is part of your computer’s operating system. Place your document on the scanner. Select the Preview button to scan in the image. 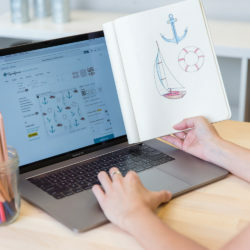 The Preview screen will appear displaying your document on the computer screen. Select the Single Marquee button located in the Marquee section at the top left portion of the window. Select the image by clicking on the screen and moving the handles of the rectangle with the cursor until the image is encapsulated within the box. 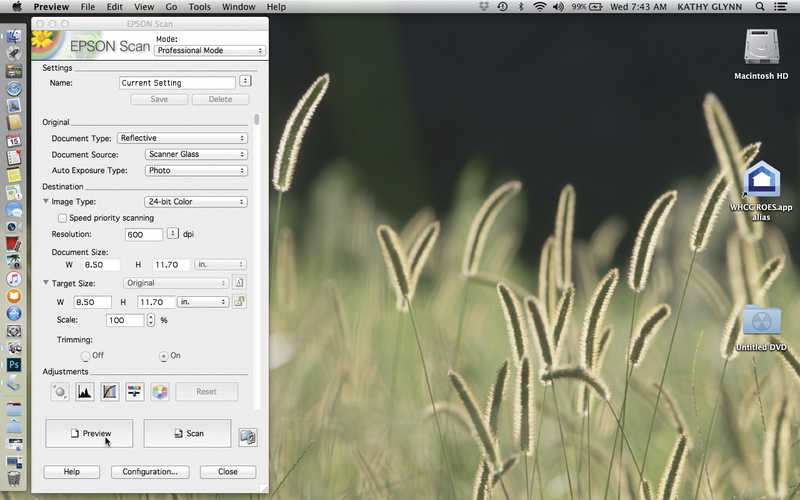 Click the Zoom button to see a more detailed display of your image. If everything looks fine, click the Scan button on the Epson Scan panel. This will proceed to capture the image into a digital file. When the scanning is complete, a dialog box will appear. Click on Save File. Your image is now available to print or edit. Unless I get a very clean scan, I usually clean it up in Photoshop. For this example, I’m using Adobe Photoshop CC 2017. If you have an earlier version, the steps will be similar. 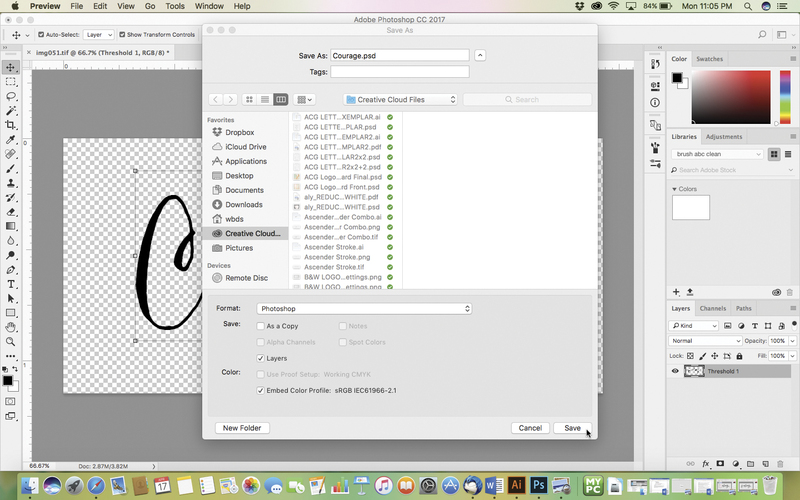 First, open the file in Photoshop by selecting File from the Application Bar, then Open. Navigate to the directory where your file is located. Select the file by highlighting it with the cursor and then click the Open button. 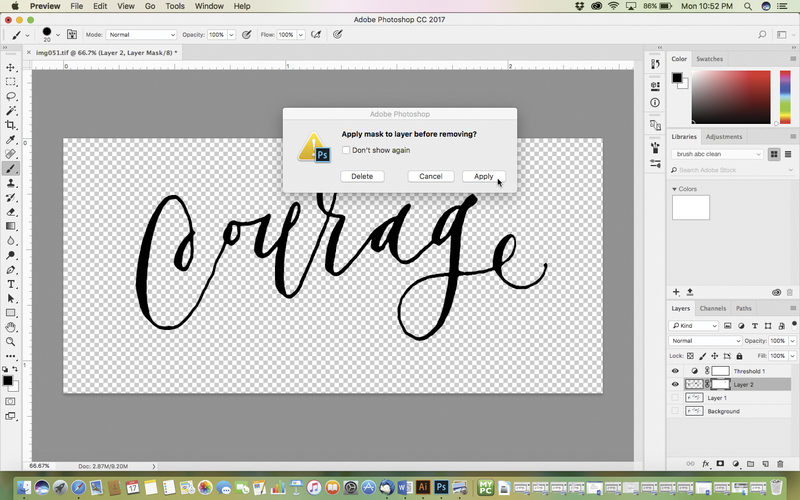 Your file will be loaded into Adobe Photoshop as a locked background layer. Create a copy of the layer by selecting Layer from the Application Bar, then New > Layer via Copy. A new layer called Layer 1 will be created. Hide the original background layer by clicking the “eye” icon. This keeps the original version of the file in case you want to start over. With Layer 1 highlighted, select Layer from the Application Bar, then New Adjustment Layer > Threshold. A new layer dialog box will appear. Click the OK button. The Properties window will appear on your screen displaying a threshold image defaulting to a value of 128. 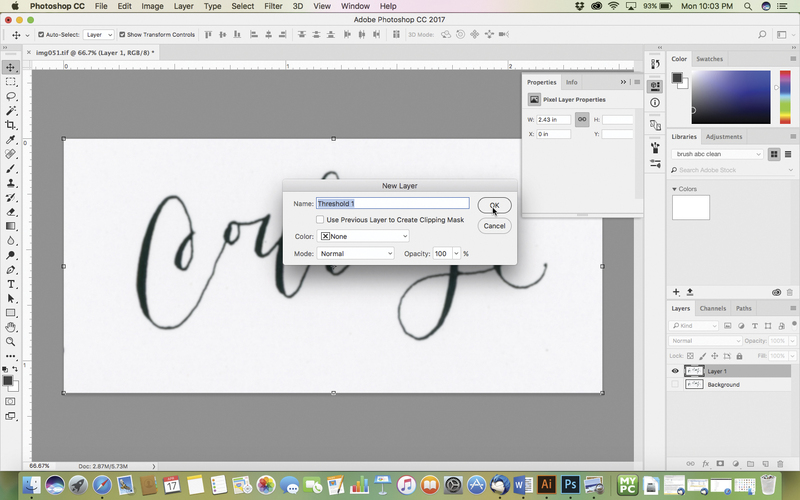 Adjust the threshold setting (usually to the right) so that the image accurately displays your lettering. Minimize the Properties window by clicking on the double arrows in the top right corner in the Properties window. With the Threshold layer selected, select the Magic Wand tool from the Tool Panel. Click on the white area of the image. This will select all the white areas on the image. Click Select on the Application Bar, then Inverse. This will select the letters only. 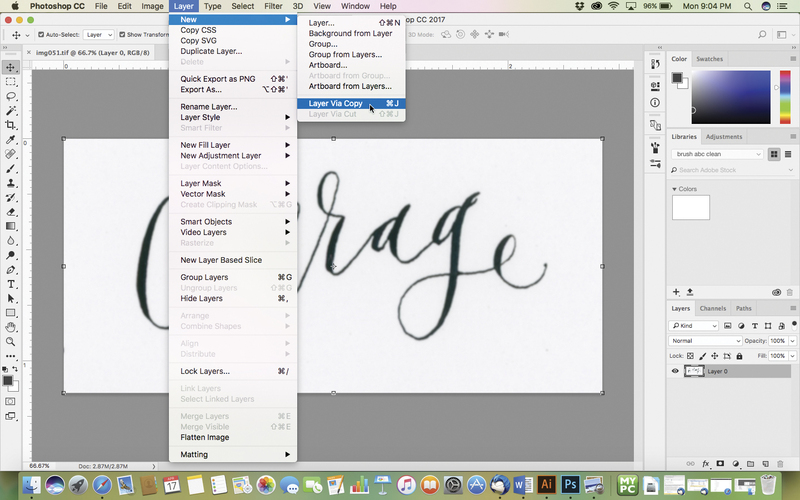 With Layer 1 selected, select Layer from the Application Bar, then New > Layer via Copy. This copies the letters to a new layer (Layer 2) with a transparent background. Click the “eye” next to Layer 1 to hide the layer and you will see Layer 2 has a transparent background. 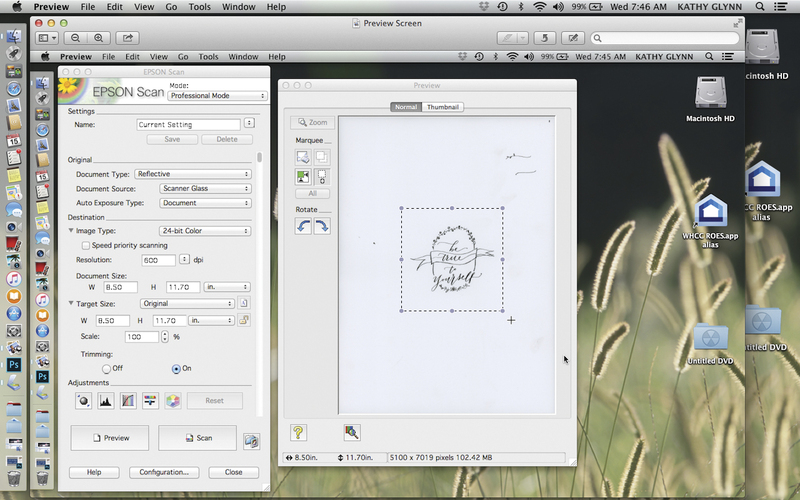 With Layer 2 selected, click on the Add Layer Mask at the bottom of the Layers Panel. This will add a layer mask to Layer 2. Check to ensure that the Foreground Color is set to black. 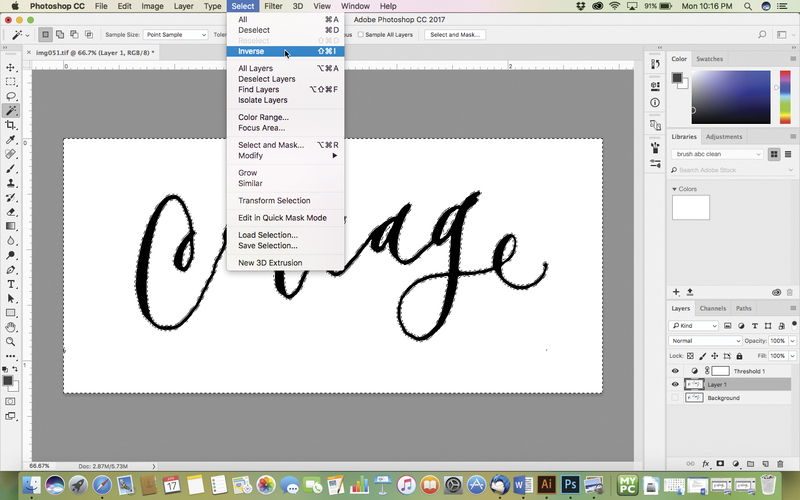 With the Layer Mask thumbnail highlighted, select the Brush tool on the Tool Panel. 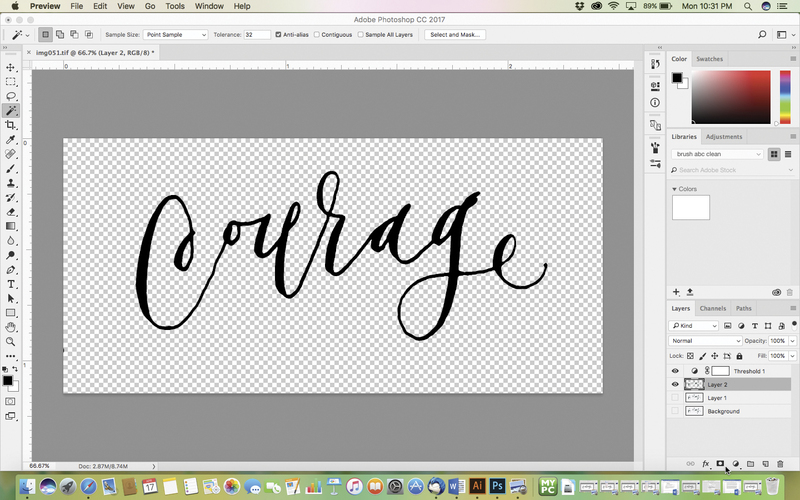 If there are any edits you would like to make to the lettering, including removing any dust specks or ink blots or slight cleanup to a particular letter, simply paint the area with the Brush tool. It’s like a magic eraser, but it doesn’t actually make the edits until you apply the layer mask permanently. If you change your mind about an edit you made, simply toggle the Foreground Color to white and paint over the area. What was removed will now reappear. Once you have completed your edits, with the Layer Mask thumbnail highlighted, click on the trash can icon at the bottom of the Layers Panel. A dialog box will ask if you would like to “Apply mask to layer before removing.” Click the Apply button. The edits you made are now permanent. 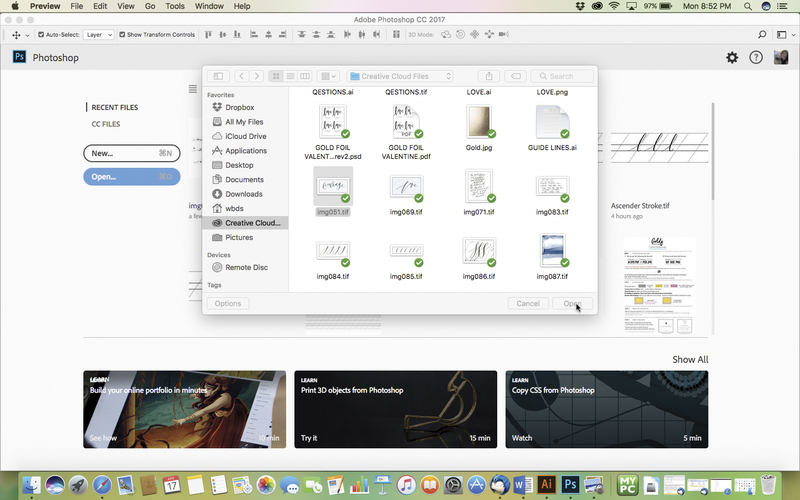 With both layers (Layer 2 and Threshold 1) selected, select Layer from the Application Bar, then Merge Visible. The two layers have now become one. Select the two bottom layers (Layer 1 and Background), and click on the trash can icon at the bottom of the Layers Panel, deleting both layers. Save the file under a new name (File > Save As). 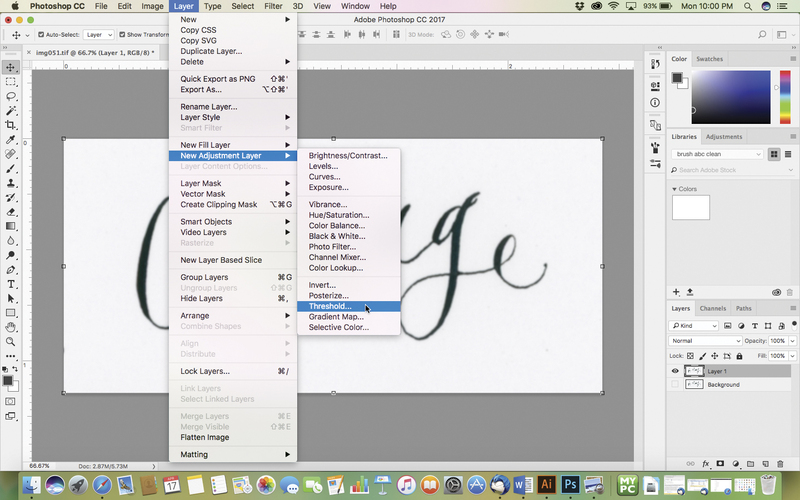 If you want to change the color of your lettering, double-click on the layer; the Layer Style dialog box will appear. Check the box next to Color Overlay under Styles. Click on the color box. Select the color of your choice in the Color Picker dialog box. 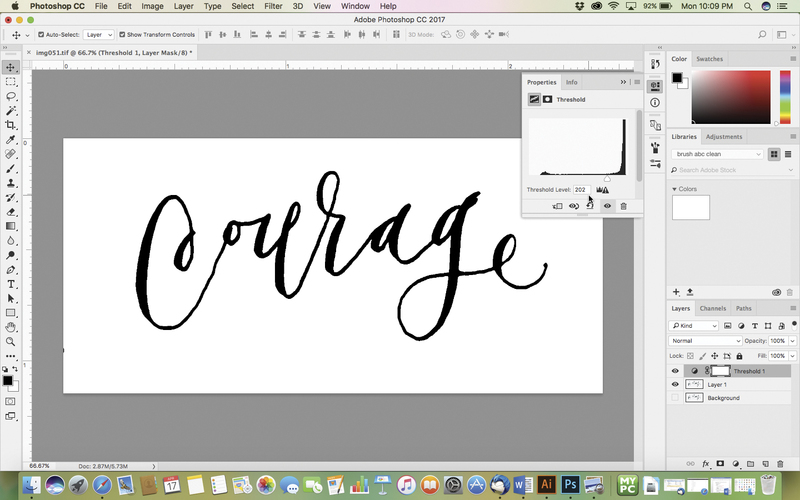 Select OK.
Kathy will be back on the blog next week to share the second part of her tutorial: adding a watercolor background and creating a repeat with your hand lettering. If you’re eager for another hand lettering design tutorial while you wait, see how to turn a love note into a keepsake using Photoshop. 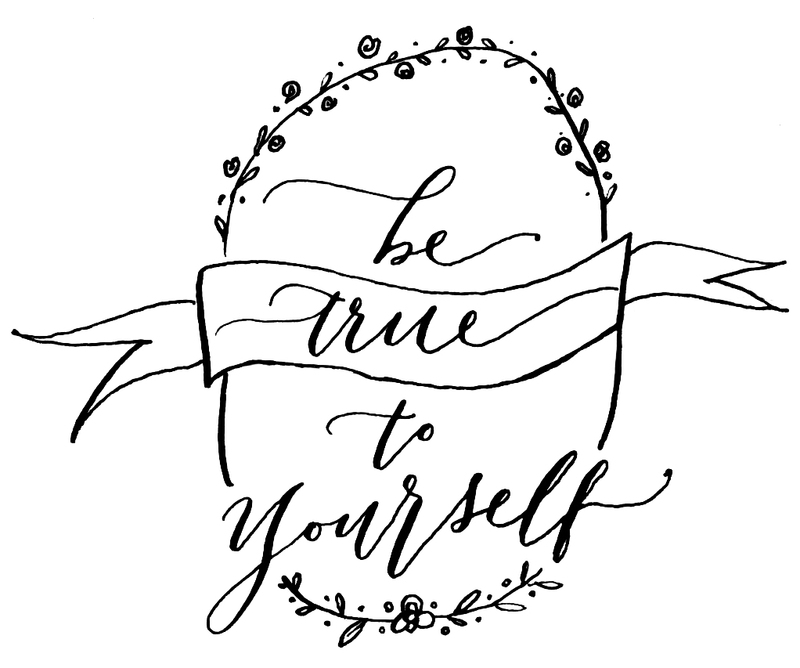 Kathy Glynn is an artist, calligrapher and newly-published author of Hand Lettering Step by Step: Techniques and Projects to Express Yourself Creatively (Get Creative 6, February 2018). Her lovely abstract paintings in watercolor and acrylics are sold nationally in West Elm, and online at Domino Magazine (Domino.com), and Minted.com. Her calligraphy has been featured on popular wedding blogs, Style Me Pretty, 100 Layer Cake and Wedding Sparrow. 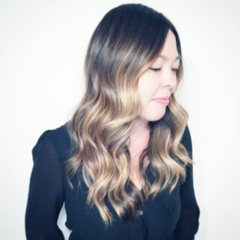 Kathy shares her creative musings on social media as Artsy Canvas Girl. Kathy’s first book, Hand Lettering Step by Step: Techniques and Projects to Express Yourself Creatively (Get Creative 6, February 2018), will help you to master hand lettering, brush lettering, and pointed pen calligraphy—to create lettering that’s expressive, exquisite, and romantic. 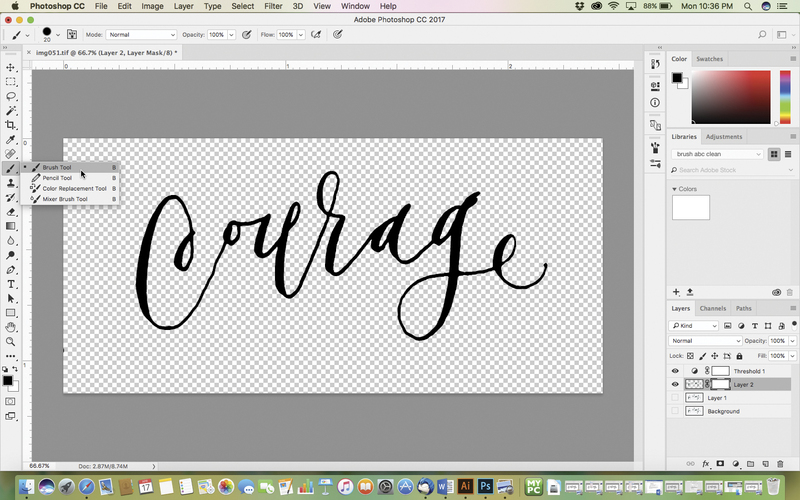 After explaining the basics, Kathy explains how to combine styles, add embellishments, and even digitize lettering. 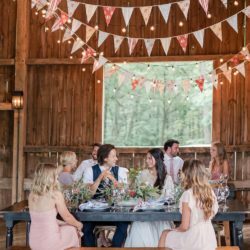 The book contains more than 20 DIY projects including wedding invitations, temporary tattoos, DIY fabric, metal etching, and a custom family tree. Hi I know this is very random to say, but, here goes! I have asked God for direction. To help me find some hope in my life. I have so desperately wanted to learn the art of Calligraphy! It’s beauty to me in such a unique form. I long to learn and master this due to losing my entire life b cause of severe disabilities. After 25 years of working as a professional dental assistant, my health took everything away. I am trying to find a way to make extra money because my disability check isn’t enough to support myself and little boy. I spend days on end looking and praying that God will allow a door to open for me. I made Lampwork beads for about 10 years and China put me out of business. Now I look at Pinterest and think how can I start something that I can’t wait to wake up and make. Just like my job of helping my patients. I know in my heart I can do something to start a business. 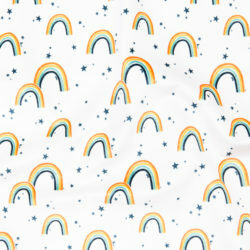 I love Spoonflower and started looking at fabric. I want to make baby mobiles. All the while I have been searching for a class to learn the art of Calligraphy. I am blown away that I found your article. I have to believe that was not a accident. I am not very good with the computer. Even at that I truly long to ask for someone to help direct me on how to start. By now you probably think I am crazy. I just want to enjoy making others happy . To turn my health into a place of knowing I can do all things. Would you please be willing to reach out to me, please.